I sent out a little bird scout to find the best books for you. This is the result. There are thousands of books available on all aspects of growing vegetables, herbs and everything and anything to do with organics. Where to start? Here of course! The books in the list below all punch above their weight. I believe them to be either unique or the best in their field. I either have them myself or have borrowed them; so muck in and have a read with my highest recommendation. Drink up, drink more water they say! But sometimes we've had enough fruit or don't want another carrot, a smoothie's too filling and we find water boring... What to do? Make your own Enhanced Water that's what. A five star book for every child... and adult, who's lucky enough to have delved into it and come up breathless with crafty happiness. It's a wonderful book, full of wonderful things to make, and almost as good is the fun and imagination that happens when you go out-and-about collecting nature's materials. Click to read more and purchase. It's hard to put this book down. What a treasure-trove mix of facts and wit. The information goes into seemingly nanoparticles (to use the latest buzzword) of roots, soil and everything in-between that makes plants grow. "Roots Demystified" is fascinating, gripping, but oh so easy to read. The meticulous illustrations serve to further prove that this book is the quintessential guide for growing healthy plants both for the kitchen gardener and seasoned horticulturalist. Did you know that the root "map" of a cauliflower plant, shows how its roots can grow four feet deep and five feet wide? To absorb food, plants grow hairs on their roots. They don't dilly dally ? an apple tree can grow up to 17 million root hairs, that's over a mile, in its first year. Sprout your cucumber seeds in good friable soil and they can send taproots down to around three feet at the rate of one inch per day. As well as a good section on vegetables, this book gives practical advice on lawns, prairies, shrubs, fruit, ornamental and native trees. Also just released is "Drip Irrigation for Every Landscape and All Climates". Sunset magazine's blog review says: "Fun book, great info. Buy it and save the world's water supply. 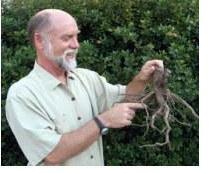 "Roots Demystified" goes underground so that you as a gardener can be on top. You simply cannot grow anything but tip-top plants once you've buried into this book with all its revealing knowledge. Click Roots Demystified: Change Your Gardening Habits to Help Roots Thrive to find out more. Isabell Shipard's 30 years of research and information on growing and using over 500 herbs, culinary herbs, medicinal herbs and edible plants, plus information on over 100 sprouts, sprouting seeds and self sufficiency. For health and wellbeing How Can I Use Herbs in My Daily Life? is highly acclaimed worldwide. Published in Australia, this comprehensive herb book has more than 280 beautiful photos. As well as being a practical guide to growing and using culinary and medicinal herbs, it compiles natural herbal remedies, pain relief, nutrition and alternative herbal medicines. Secret Garden of Survival: How to grow a camouflaged food-forest. If you are serious about putting food on your table, you need to get this book! This book packs a ton of information into a single, compact resource. This is the best explanation of permaculture you'll ever read. Imagine a food garden where you rarely have to re-plant, that takes up very little space, and will provide food for you and your family for the next 30 years. Click here.